Bob Cranshaw, bass; Billy Higgins, drums. It seems hard to realize that almost eight years have passed since a precociously gifted eighteen-year-old trumpeter named Lee Morgan made his first startling impact on the jazz scene by joining the brass section of Dizzy Gillespie's big band. Lee had well over a year of section work to his credit, not to mention the solo exposure often accorded him by his proud and unselfish boss. 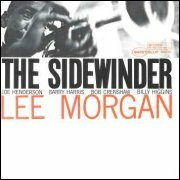 Since the dissolution of the orchestra in January of 1958, Lee's remarkable maturity as a solo voice has been reflected in his work with Art Blakey for a couple of years, and more recently in a group with Jimmy Heath at Birdland as well as a variety of other small-group settings. Part of his time has been spent back home in Philadelphia, but since the summer of 1963 he has been more active again on the New York scene. The present sides mark his return to the studios for Blue Note in a session with a specially assembled and impressively strong personnel. Of the compositions brought in for this occasion--all originals by the leader--it is interesting to note that all five are based on changes that are simple enough to offer a good blowing base, yet sufficiently varied and personal to avoid triteness or monotony. The title number might best be described as a long-meter blues (24 measures to the chorus). The fascinating rhythm section figure established during the opening ensembles is sustained throughout the solos, giving the performance a deep blue tinge as well as a Latin touch. Lee's solo, fluent and sensitively constructed, never becomes grandstandy and relies at times on essentially simple devices, such as the repeated B flat in the last of his three choruses. Joe Henderson's solo is rich in melodic variety (note the contrast between the busy opening and simple continuation in his second chorus). Barry Harris's piano picks up in intensity as it goes along, aided on his third chorus by the horns' backing. Bob Cranshaw bears out Lee's complimentary observations in a fine solo that owes part of its success to the continued pulsing of Billy Higgins' percussion figures. "Totem Pole," named for the effect of Lee's alternation with Joe, is a group of six notes they play going into and coming out of the release. As Lee himself agrees, this track contains some of the best individual blowing in the album. Lee's own personal phrasing and occasional use of half-valve effects are in evidence; as for Joe, he always puts down his instrumental foot where the beat is, never letting you lose track of the rhythmic or harmonic structure. Harris's solo, partly in octaves and later in single-note lines in the tradition of Bud Powell, sustains the interest until Lee returns to solo agains some intense and exciting rhythmic section work. Of "Gary's Notebook," Lee says: "Gary's a friend of mine, and he's real serious--quite an intellectual guy. No matter what he's doing, whether he's riding the subway or just sitting around the house, he's always doodling, or figuring something out. The tune is a blues, which is a simple form, but there's a lot to play. The line is not too simple, and that's the way Gary is--a basic guy, but kind of deep." "Boy, What A Night" is a blues waltz, but this time with more of a funky feeling and a 12/8 meter, with a very basic character to both melody and changes. On his solo here, it seems to me Lee reflects some of the Gillespie influence in his phrasing and in the ability to string ideas together at considerable length. Note Harris's sly fills in the closing reprise of the theme, and the old-timey blues ending. "Hocus-Pocus" is, as Lee comments, "Just a simple tune, a nice easy blowing thing with the standard chorus length. I wanted to get away from straight blues. After I'd written it Barry Harris pointed out that the changes are the same as "Mean To Me," except for a slight difference in the channel."